Lee Sharpe is best known for his time spent at Manchester United. Beginning his career at Torquay United, Man Utd spotted his potential and signed Lee for a record fee of £200k. Once he had secured a place in the first team, Sharpe became was an integral part in United’s success in the European Cup Winners’ Cup in the 90-91 season. 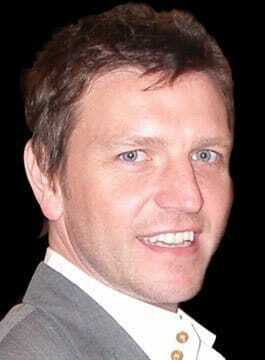 During eight years at Old Trafford Lee Sharpe played 265 games and scored 36 goals. Moving to Leeds in the summer of 1996, he was the club’s record signing at £4.5 million. His time at Leeds was plagued with injuries, making just 26 Premiership appearances in 1996–97. A knee injury ruled him out for the entire 1997–98 season, after which Lee was unable to secure his place in the team. In the autumn of 1998, he was loaned to Italian Serie A side Sampdoria until early 1999, and then in March he went on loan to Bradford City, helping in securing the club’s promotion to the Premiership after 77 years outside the top division. He stayed at Bradford and helped preserve the club’s Premiership status in the 1999–2000 season. Following a brief trial stay with Grimsby Town he signed for Exeter City, and this was followed with a short spell at Grindavík FC in Iceland. In June 2003, aged just 32, Lee Sharpe announced his retirement from professional football. As an after dinner speaker Lee Sharpe entertains audiences with anecdotes and numerous stories from his life in and off the pitch.